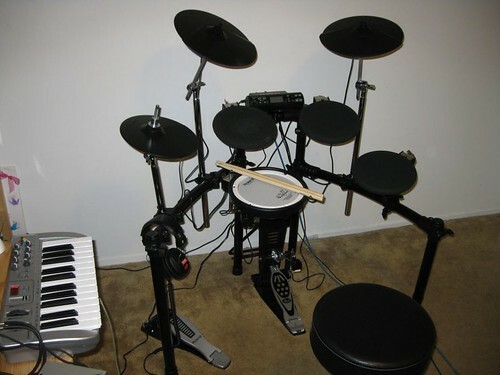 On the Vdrums forum a lot of folks tell beginners to get the TD-9 kit, with all mesh heads, if they can afford it. I am sure that is good advice for many, especially if you are going to play live. I haven’t played it, but they say that the TD-9 brain has better sounds and more expansion capabilities. For my purposes, I am happy with the TD-4. The sounds are fine for practicing, and good enough to play out if you wanted to. However, mostly I will use it to send midi to the computer to trigger drum samples, so the built-in sounds don’t matter much. A real advantage of the TD-4 setup is that it is compact. It fits fine in the small bedroom where I play, and it would work for a coffeehouse gig too. I am pleased with it. I am glad that it has a mesh snare. The rebound and feel are very similar to playing an acoustic snare. I don’t mind the rubber tom pads. They could be upgraded later, but I doubt that I will. A lot of people upgrade the highhat. An acoustic highhat has two small cymbals that move up and down and clamp together. You can get an open sound, a closed sound, or in between, depending on where the pedal is. The highhat on this kit is one rubber pad with an electronic pedal that emulates the mechanical movement. After while, it almost seems as if the pad is moving, but it is an acoustically induced illusion. It works. To get the kit sending midi to the computer I loaded the demo for a VSTi called Addictive Drums, a popular drum plugin. I opened Reaper, my recording software, inserted a track, and set it to monitor midi channel 10, which is normal for percussion. I loaded the Addictive Drums plug into the track and hit the snare. It worked! Then I hit the highhat and got a crash sound, hit the crash and got a closed highhat. The rest of the sounds were all in the wrong places. This meant that I had to load a drum map that would line up the Roland Vdrums midi information with the AD plug. I spent some time on the Reaper forum asking questions, and finally got some answers, mostly from a guy in France. The internet is amazing. The AD demo sounds great, but it only has a snare, a kick drum, a highhat, and a crash cymbal. The full version costs $299. You can actually do a lot with that minimal kit, however. I did a quick instrumental with two guitars, bass, and drums. I won’t post the results here because it is too sloppy. It sounds like a high school garage band trying to learn an old Steely Dan song. However, I was happy. I had actually played drums on a track! When I ordered my new music computer from Jim Roseberry at Studiocat, I also got a set of drum samples called Jet City. I haven’t tried these yet because I need Native Instruments Kontakt 4 to play them, but that is what I plan to use with this drum set. Kontakt 4 is coming. More on this particular mid-life crisis later. I'm a guitar-playing rhetorician professor. This entry was posted in Music and Guitar and tagged midi drums, vdrums. Bookmark the permalink. Great post!! Thanks for sharing!